Today is Easter Sunday :-) It is the day when Christ has risen from the dead. BUT why call it easter Sunday and celebrate it using painted eggs and bunnies? I have to digress from the eggs and bunnies and Ishtar and proceed to my recipe. What we are about to post another slow-cooked chicken soup dish that is almost similar to tinola (see our tinola recipe posted earlier - Slow-cooked Chicken Tinola) but since I am unsure as to the use of the word tinola, I named it as is. In Singapore, we often use kampong chicken for this recipe and other soup based dishes. Kampong Chicken according to the merchandisers in the Supermarkets in Singapore are those "running-wild or wild-running" chicken. I think they are referring to native chickens that are left out to roam around their yards freely. The price is more than twice as much as the regular chicken being sold in supermarkets. Philippine native chickens are also priced as high as this kampong chicken. Maybe because this native chickens are tastier as compared to the regular chicken. Here's a simple slow-cooked chicken soup recipe. And like any slow-cooked meat soup dishes, it offers not only a fall-off-the-bone-tender chicken meat but also a delicious and very flavorful soup. You can use any breed of chicken available in your area. 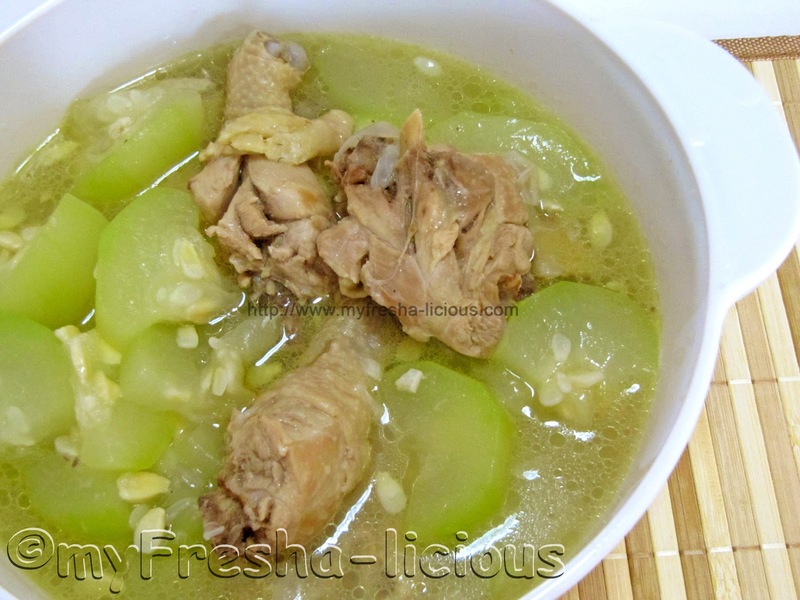 Oh, by the way, compare this recipe to the chicken tinola recipe we have posted earlier (see Slow-cooked Chicken Tinola ). Have you noticed the change in the nutritional values? The addition of fish sauce almost doubled the sodium content of this recipe. Not to mention that using different parts of a chicken will either give you a lower or higher calorie dish. Put the oil and the garlic in a soup pot and sauté garlic in it in medium fire. Add the ginger and the onion and stir until aromatic. Add in the chicken cuts and pan sear the meat until the chicken’s own oil comes out. Pour water as many as you want. Bring the chicken to a boil and slow cook the chicken for at least 2 hours under low fire. Do check the water level every 20 to 30 minutes. Add more water as needed. Add the bottle gourd and cook it until it’s soft. Serve it with steamed wholegrain red rice. Makes 3 to 4 servings. Here’s the estimated Nutritional values per per serving based on the ingredients used. Please note that most of the sodium content will be in the broth. Saturated fat : 5.93 g.
Dietary fiber : 1.2 g.